Did you know that the sense of sight has a huge impact on your business? About a quarter of our brains are involved in visual processing. This behavioral economics podcast is all about the sense of sight. I share the surprising truth about what percentage of the body’s sense receptors are in the eyes and why our subconscious is so visual and the impact that has on our businesses. This is the beginning of a series on the five senses – beginning with sight and moving through sound, touch, taste and smell (not necessarily in that order). 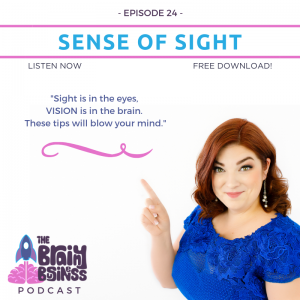 I am starting with sight because it is the most powerful of our senses by far and the things I am going to share with you in this episode are going to just blow your mind. [14:48] There is so much more to know thank you think about the sense of sight and how it absolutely impacts your business. [15:23] I’m beginning with sight, because it’s the most impactful. About a quarter of our brains are involved with visual processing. [16:05] About 70% of the body’s sense receptors are in our eyes. This is why our subconscious is so visual. [17:11] Is vision in your eyes or in your brain? [17:24] The sense of SIGHT takes place in the eyes. It is all the little bits of information coming into them. But Vision? Vision does not actually happen in your eyes. VISION is in your BRAIN and is much more complex than simple sight. [17:56] Vision is actually built on expectations in the brain based on past experience. [18:39] The sense of sight is bringing in a lot of stimuli it can’t actually interact with – light, color, contrast – in a big flood of information all the time. The process of INTERPRETING that information is a task for the brain. [20:30] When we present our product data for our business, people’s brains will fill in the gaps and tie things together. [21:47] Inside the retina are photoreceptors – perhaps you have heard of the rods and cones in your eye. They are shaped differently (hence their different names) because they do different things: rods are sensitive to dark versus light and cones are sensitive to color. [22:57] Color Illusions can trick the brain into thinking that it sees a different color. [24:30] FOCUS Our eyes interpret information with the highest resolution in the middle. [26:19] Impressionistic paintings were styled because of diseases in the eye. Monet’s early work was full of blues and purples that were absent in later work. Brush strokes became thicker, because he had cataracts. [28:07] Degas developed retinal disease at the age of 36, and he could not be in intense light. [28:38] When we see a Monet or a Degas you still know what the images are. Our brains piece together what they are looking at based on prior experience. [29:33] Our brains are actually conditioned to see and pick out faces. This can either be to see predators, or understand allies. [30:14] Being able to focus forward is what creates our depth perception. This is why optical illusions and a drawing on a flat sheet of paper can look three-dimensional to us. [31:47] Binocular disparity is this state of two eyes pointing in the same direction from slightly different spots (test it by looking at objects through different eyes and watch how they appear to move). [33:03] With 3D images one side is red and the other side is blue (cyan). With 3D glasses, one side takes in each color making things appear three-dimensional. [36:02] Our brains are constantly scanning and interpreting information. We scan the world around us three times every second. [37:02] This is why priming impacts behavior and ads have impact on people even though they say they don’t watch them. [37:42] Our brains take things in but don’t alert the conscious brain unless there’s a reason to. [38:17] Remember vision is in our brains. We have evolved so we can focus on one thing while constantly scanning our environment. [38:45] Saccades are why things like flip books work – our brain weaves together a stream of basically still images and connects the missing pieces. [40:24] When the actor on camera is supposed to be watching something go from one side of the shot to another, they need to actually watch someone (or something) go from one side to the other so the camera doesn’t pick up their eyes darting all over the place. [41:52] Our brains need to deploy selective attention to only flag the conscious brain of what matters. [46:58] What is reality? Do we all live in the same reality? Or is my reality different from yours? [48:20] Miscommunications come up often because we are unwilling to believe that our way is not the only way and that multiple people and perspectives can still be right. [49:18] Our brains can often attach meaning to all sorts of things when they aren’t there. [51:26] Our brain mostly thinks in images and emotions and processes them constantly and basically instantaneously. [52:00] When it comes to your brand and business it is worth investing in great images. DO NOT use clip art or stretch out images to fit a size so that your logo or a person’s face is stretched out. The brain picks up on the discrepancy immediately and assumes you are amateur. [53:39] You can say MORE with a lot LESS if you have a strong and strategic image with a lot less WORDS. [54:58] Basically, everything has too much copy. We need to decide the ONE THING to focus on and then put everything into that effort. [56:51] Our life is a string of memories – including the way we interact with brands. Brands are memories. And because the memory is heavily composed of visuals and emotions – the visuals you choose to use will impact how people think of you, your business, and your brand. [59:26] Be intentional about what people see when you create a video or when they walk into your store or place of business. How Do Our Brains Reconstruct the Visual World?